This is a quick start guide of setting up a node.js testing environment for U2F. For details, please refer to the github page of u2f-sample-server. It is a ready-to-use node.js package to test U2F tokens. It is a demo to show how to register a U2F device and later authenticate it. Messages exchanged between the server (relying party), the browser (client), and the U2F devices are shown. To allow the use of the built-in U2F plugin of Chrome browser, the package contains self-signed certificate for SSL connection. 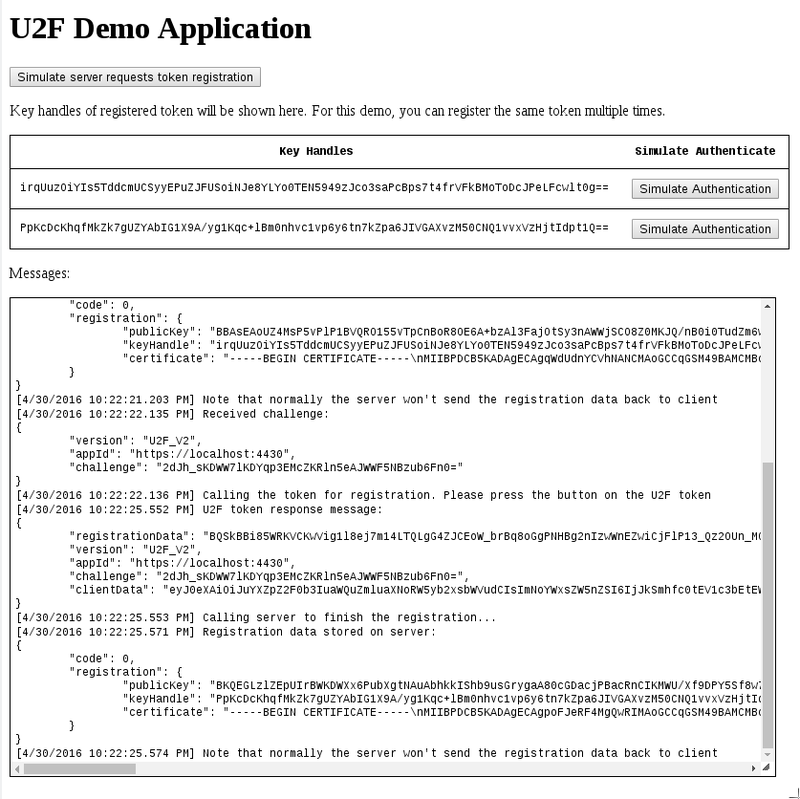 Note that although u2f-sample-server demonstrates the full register and authenticate workflow, it is not the proper way to do it in real-life application. For example, the registered U2F devices should be associated with particular account and stored in database rather than session. In your Chrome / Chromium browser, navigate to https://localhost:4430/demo and start testing the U2F registration and authentication workflow. As of May 2016, there is bug in the node-u2flib-server module. If you encountered the following error when starting the server, you will need to comment out one line of code. Please refer to the github page for details.